Inner tracker barrel of the Compact Muon Solenoid (CMS). Courtesy of CERN. The High Energy Particle Physics Group at the University of Notre Dame will host a public video contest called “Rock the LHC,” from March 23-May 31, 2015. Participants are invited to create short videos about why they are interested in the research at the Large Hadron Collider (LHC). The goal of the video contest is to celebrate particle physics and the U.S. contributions to the LHC. Located in Geneva, Switzerland at the European Organization for Nuclear Research (CERN), the LHC is the largest, most powerful particle accelerator in the world. The LHC is used to advance the understanding of physical laws by testing predictions of different theories in particle physics and high energy physics. The LHC is known for its role in the discovery of the Higgs boson, which included contributions from several Notre Dame faculty and students, and nearly 2,000 scientists across the United States. 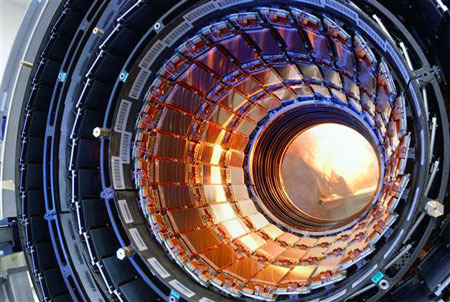 After the announcement of the Higgs boson, the LHC was shut down for upgrades and repairs. The accelerator will be restarted in the coming months and will be used to hunt for new particles and laws of nature, such as dark matter, supersymmetry, and extra dimensions. The winner of the contest will receive an all-expenses paid trip for two to Fermi National Accelerator Laboratory (Fermilab) in Batavia, Ill. Fermilab is the country’s premier particle physics facility and the hub for U.S. scientists working on the Compact Muon Solenoid (CMS) experiment, one of the experiments at the LHC that co-discovered the Higgs boson. The trip will include economy airfare to Chicago, two nights of lodging, a stipend for food and ground travel, and a VIP tour of Fermilab. The video contest is open to all legal U.S. residents who are 18 or older. Contestants must register for the contest at rockthelhc.com and upload their videos to a video-sharing website, such as YouTube or Vimeo. A panel of physicists and science communications professionals will judge the submissions and select twenty finalists to be featured on a YouTube channel for the public to review and comment. After public review, the panel of judges will select the final video and announce the winner by July 27, 2015. Originally published by Stephanie Healey at science.nd.edu on March 16, 2015.